Outdoor living is a major part of luxury home life in Arizona. The southwestern climate lends residents the amazing opportunity to enjoy more than 300 days of sunny, blue skies every year. Your Phoenix outdoor living space should be stylish and chic and also one of casual sophistication, extending from the inside to the outside of your home. Create an extension from inside to outside. Find ways to transition interior themes to your home’s exterior and vice versa. The goal with this method is to seamlessly join together the outside of your home with the inside. As a result, the colors and style of your home’s interior extend to the general theme of the exterior. Assign designated areas for entertaining and dining. If possible, aim to designate one outside area for eating and another place that offers seating for relaxing and socializing. They key is to stylistically work to make each of the individual areas complement one another. 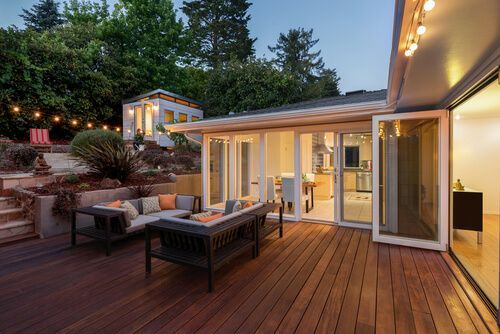 For example, if you use mocha-colored furnishings on one side of your patio, stick with your color scheme in the other areas of your backyard. Consider patios or a courtyard. Courtyards or inclusive patios can provide private, peaceful places to relax. Each option contains a wide range of features, such as gardens, fireplaces, or sitting areas. Some homeowners enjoy filling these areas with custom furniture and strings of white lights to set a magical ambience for entertaining guests during warm Phoenix evenings. Others may opt for an arrangement of comfortable chairs, next to a soothing waterfall feature, surrounding a fire pit for the ultimate serene setting. Provide the right path. Backyard paths can help divide the space in your yard to create various functional spaces. For instance, a path may serve as a border of one of your gardens to separate it from a quiet seating area. While some homeowners opt for inexpensive gravel, others might prefer more upscale, eye-catching paths featuring large stones or pavers, both of which can provide a distinctive experience as you walk to the different areas in your yard. Other path options include concrete sidewalks, which are durable and long-lasting, or bricks and flat rocks, which all can help prevent buckling or shifting. Finally, some homeowners prefer to incorporate different types of stone and materials to design a path that features a unique blend and contrast between materials. With this approach, some people combine complete or broken pieces of cut stone, for example, with gravel and fieldstone to craft attractive pathways. Searching for More Home Remodeling Ideas? Home Tour Videos. Our home tour videos depict some of our latest home remodeling projects. They also give you an inside look into how we have transformed hundreds of houses into our beloved customers’ dream homes. Home Remodeling Ideas and Guides. Our team of professionals recently published these home remodeling ideas and guides that help you during the process. The Republic West Remodeling blog. We update our blog weekly with useful information to help homeowners get the most out of their remodeling experience. Client Stories. We are proud of the more than 17,000 home remodeling projects we have completed since 1995. Each and every project had added value, joy and function to our clients’ homes. An outdoor makeover can have a significant impact on how you and your family spend your time at home. Whether you are dreaming of a modest, quiet retreat where you can relax in peace surrounded by nature, or an elegant outdoor space designed for entertaining large groups, there is an outdoor living area design to fit your lifestyle and budget. For more than 20 years, Republic West Remodeling has completed a broad range of exterior remodeling projects in Phoenix, Scottsdale, and in the surrounding communities. We offer comprehensive exterior remodeling services that will ensure your house looks amazing for many years to come. We are the Phoenix exterior home improvement contractor of choice, and we make sure that your project works for your needs and your budget.